Aaron McEneff has laughed off suggestions has he has already agreed to leave Derry City. DERRY CITY’S Aaron McEneff admits he hasn’t decided his future. The talented midfielder, who has netted 15 goals this season, is a free agent at the end of the season. I have seen and heard things that I’m doing this and that, but I’m here to play football and play the remaining three games and then I’ll worry about that at the end of the season. McEneff concedes that while he has held talks with his home town club he just wants to fully focus on their remaining three league games and then decide what’s next for him. “I have spoken to the club already and I’ll be speaking to them again, as the door is always open,” he insisted. “However, I just said to them that I just want to focus on my football and leave all that sort of stuff till the end of the season because the main thing is what you do on the pitch and I don’t really like to think about too many things. In recent years the likes of Patrick McEleney, Dean Jarvis, Barry McNamee and Aaron Barry to name but four have all departed the Brandywell as free agents and McEneff leaving the Foylesiders would be another blow to Kenny Shiels’ side. 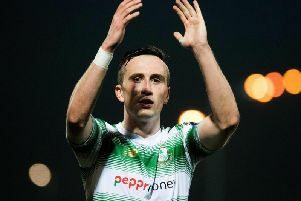 The 23-year-old also laughed off suggestions that he has already agreed a deal with either Dundalk or Shamrock Rovers. “Apparently everything is done and I have signed for someone else, but there’s nothing done,” he stated. “It’s a fact that nothing is done, so I’m just going to play in these last three games and then we’ll see what happens at the end of the year. The ex-Spurs starlet felt Derry deserved to get back to winning ways at Limerick, on Friday night. However he did admit that the Candy Stripes weren’t at their best in the second half at the Market’s Field but conceded that Ronan Hale’s first half strike was enough to win their first league game since July. “I think the three points was the main thing,” he insisted. “We knew coming down here it was going to be a tough task, the surroundings there’s no atmosphere and you have to try and create that yourself. That clean-sheet was Derry’s 400th in the League of Ireland Premier Division, something which pleased the ex-Maiden City Soccer man. “We have to take the clean-sheet as another positive from the game, as it’s probably one of the only clean-sheets this season,” he joked.